Nero, Roman emperor from 54 to 68 AD, was born at Antium on the 15th of December 37. He was the son of Gnaeus Domitius Ahenobarbus and Agrippina the younger, and his name was originally L. Domitius Ahenobarbus. His father died when Nero was scarcely three years old. In the previous year (39) his mother had been banished by order of her brother Caligula (Gaius) on a charge of treasonable conspiracy, and Nero, thus early deprived of both parents, found shelter in the house of his aunt Domitia, where two slaves, a barber and a dancer, began his training. The emperor Claudius recalled Agrippina, who spent the next thirteen years in the determined struggle to win for Nero the throne which had been predicted for him. Her first decisive success was gained in 48 by the disgrace and execution of Messallina, wife of Claudius. In 49 followed her own marriage with Claudius, and her recognition as his consort in the government. 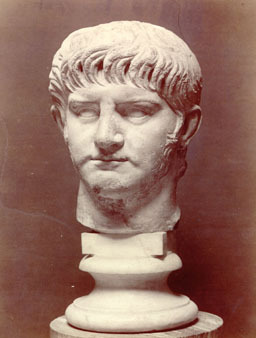 The Roman populace already looked with favor on Nero, as the grandson of Germanicus Caesar, but in 50 his claims obtained formal recognition from Claudius himself, who adopted him under the title of Nero Claudius Caesar Drusus Germanicus. Agrippina's next step was to provide a suitable training for her son. The scholar L. Annaeus Seneca was recalled from exile and appointed his tutor. On the 15th of December 51 Nero completed his fourteenth year, and Agrippina, in view of Claudius's failing health, determined to delay no longer his adoption of the toga virilis. The occasion was celebrated in a manner which seemed to place Nero's prospects of succession beyond doubt. He was introduced to the senate by Claudius himself. The proconsular imperium and the title of princeps juventutis were conferred upon him. He was specially admitted as an extraordinary member of the great priestly colleges; his name was included by the Arval Brethren in their prayers for the safety of the emperor and his house; at the games in the circus his appearance in triumphal dress contrasted significantly with the simple toga praetexta worn by Britannicus. During the next two years Agrippina followed this up with energy. Britannicus's leading partisans were banished or put to death, and the all-important command of the praetorian guard was transferred to Afranius Burrus, a Gaul by birth, who had been the trusted agent first of Livia Drusilla and then of Tiberius and Claudius. Nero himself was put prominently forward. The petitions addressed to the senate by the town of Bononia and by the communities of Rhodes and Ilium were gracefully supported by him in Latin and Greek speeches, and during Claudius's absence in 52 at the Latin festival it was Nero who, as praefect of the city, administered justice in the forum. Early in 53 his marriage with Claudius's daughter Octavia drew still closer the ties which connected him with the imperial house. Agrippina determined to hasten the death of Claudius, and the absence, through illness, of the emperor's trusted freedman Narcissus, favored her schemes. On the 13th of October 54 Claudius died, poisoned, as all our authorities declare, by her orders, and Nero was presented to the soldiers on guard as their new sovereign. From the steps of the palace he proceeded to the praetorian camp to receive the salutations of the troops, and from there to the senate house, where he was promptly invested with all the honors, titles and powers of emperor. Agrippina's bold stroke had been completely successful. Only a few voices were raised for Britannicus; nor is there any doubt that Rome was prepared to welcome the new emperor with genuine enthusiasm. His prestige and his good qualities, carefully fostered by Seneca, made him popular, while his childish vanity, ungovernable selfishness and savage temper were as yet unsuspected. His first acts confirmed this favorable impression. He modestly declined the title of pater patriae; the memory of Claudius, and that of his own father Domitius were duly honored. The senate listened with delight to his promises to rule acccrding to the maxims of Augustus, and to avoid the errors which had rendered unpopular the rule of his predecessor, while his unfailing clemency, liberality and affability were the talk of Rome. Much no doubt of the credit of all this is due to Seneca and Burrus. Seneca had seen from the first that the real danger with Nero lay in the savage vehemence of his passions, and he made it his chief aim to stave off by every means in his power the dreaded outbreak. The policy of indulging his tastes and helping him to enjoy the sweets of popularity without the actual burdens of government succeeded for the time. During the first five years of his reign, the golden quinquennium Neronis, little occurred to damp the popular enthusiasm. Nero's promises of constitutional moderation were amply fulfilled, and the senate found itself free to discuss and even to decide important administrative questions. Abuses were remedied, the provincials protected from oppression, and the burdens of taxation lightened. On the frontiers, thanks chiefly to Corbulo's energy and skill, no disaster occurred serious enough to shake the general confidence, and even the murder of Britannicus seems to have been accepted as a necessary measure of self-defence. But Seneca's fear lest Nero's sleeping passions should once be roused were fully verified, and he seems to have seen all along where the danger lay, namely in Agrippina's imperious temper and insatiable love of power. The success of Seneca's own management of Nero largely depended on his being able gradually to emancipate the emperor from his mother's control. During the first few months of Nero's reign the chances of such an emancipation seemed remote, for he treated his mother with elaborate respect and consulted her on all affairs of state. In 55, however, Seneca found a powerful ally in Nero's passion for the beautiful freedwoman Acte, a passion which he deliberately encouraged. Agrippina's angry remonstrances served only to irritate Nero, and caresses equally failed. She then rashly tried intimidation and threatened to espouse the cause of Britannicus. Nero retaliated by poisoning Britannicus. Agrippina then tried to win over Nero's neglected wife Octavia, and to form a party of her own. Nero dismissed her guards, and placed her in a sort of honorable confinement. During nearly three years she disappears from the history, and with her retirement things again for the time went smoothly. In 58, however, fresh cause for anxiety appeared, when Nero was enslaved by Poppaea Sabina, a woman of a very different stamp from her predecessor. High-born, wealthy and accomplished, she was resolved to be Nero's wife, and set herself to remove the obstacles which stood in her way. Her first object was the final ruin of Agrippina, and by rousing Nero's jealousy and fear she induced him to seek her death, with the aid of a freedman Anicetus, praefect of the fleet of Misenum. Agrippina was invited to Baiae, and after an affectionate reception, was conducted on board a vessel so constructed as, at a given signal, to fall to pieces. But Agrippina saved herself by swimming, and wrote to her son, announcing her escape, and affecting entire ignorance of the plot. A body of soldiers under Anicetus then surrounded her villa, and murdered her in her own chamber. Nero was horrorstruck at the enormity of the crime and terrified at its possible consequences. But a six months' residence in Campania, and the congratulations which poured in upon him from the neighboring towns, where the report had been officially spread that Agrippina had fallen a victim to her treacherous designs upon the emperor, gradually restored his courage. In September 59 he re-entered Rome amid universal rejoicing. A prolonged carnival followed. Chariot races, musical and dramatic exhibitions, games in the Greek fashion rapidly succeeded each other. In all the emperor was a prominent figure, but these revels at least involved no bloodshed, and were civilized compared with the gladiatorial shows. A far more serious result of the death of Agrippina was the growing influence over Nero of Poppaea and her friends. In 62 Burrus died, it was said by poison, and Seneca retired from the unequal contest. Their place was filled by Poppaea, and the infamous Tigellinus, whose sympathy with Nero's sensual tastes had gained him the command of the praetorian guards in succession to Burrus. The haunting fear of conspiracy was skilfully used by them to direct Nero's suspicions against possible opponents. Cornelius Sulla, who had been banished to Massilia in 58, was put to death on the ground that his residence in Gaul was likely to arouse disaffection in that province, and a similar charge proved fatal to Rubellius Plautus, who had for two years been living in retirement in Asia. Nero's taste for blood thus whetted, Octavia was divorced, banished to the island of Pandateria and barbarously murdered. Poppaea's triumph was now complete. She was formally married to Nero; her head appeared on the coins side by side with his; and her statues were erected in the public places of Rome. In the course of the year 61 Rome was startled by the news of a disaster in Britain. At the time of the Claudian invasion of Britain in AD 43 Prasutagus, the king of the Iceni, had concluded a treaty with Claudius, by which no doubt he recognized the suzerainty of Rome and was himself enrolled among "the allies and friends of the Roman people." The alliance was of value to Claudius, for the territory of the Iceni (Norfolk, Suffolk, and Cambridgeshire) lay immediately north of the new province and its capital town Colchester, and Prasutagus had loyally kept faith with Rome. But in AD 61 he died. leaving no male heir. His kingdom therefore lapsed to Rome, and Prasutagus, anxious that the transfer should be effected in an orderly way, divided his accumulated wealth between his two daughters and the emperor. His plan failed, for the local Roman officials acted as though the kingdom had been conquered in war; they seized on the property of the late king and his chiefs and insulted his family. Fearing that worse might follow when the kingdom should be annexed, and encouraged by the absence of the legate and his legions, the Iceni, led by Prasutagus's daughter Boudicca (Boadicea) rose in revolt and were joined by the Trinobantes in Essex, who had been long subject to Rome and had their own grievances to redress. Colchester, since AD 50 a Roman colony, was sacked. The ninth legion which had hurried from Lincoln was cut to pieces, and the insurgents prepared to march on London. The news of the outbreak found the legate Suetonius Paulinus engaged in attacking Anglesey. His resolution was at once taken. At the head of such light troops as he could collect, he marched in haste along the Watling Street, leaving orders for the legions to follow. Though the tribes along the road were rising Suetonius succeeded in reaching London, only however to find himself too weak to hold it. He was obliged to fall back along the road by which he had come. London first, and then Verulam, were abandoned to the Britons. At last at some undefined point on the Watling Street his legions joined him. Thus reinforced he turned to face the enemy. The engagement was severe but the Roman victory was decisive, and Roman authority was restored throughout central and southern Britain. The profound impression produced in Rome by the "British disaster" was confirmed two years later in AD 63 by the partial destruction of Pompeii by an earthquake, and the news of the evacuation of Armenia by the Roman legions. A far deeper and more lasting impression was produced by the great fire in Rome. The fire broke out on the night of the 18th of July, 64, among the wooden booths at the southeast end of the Circus Maximus. From there in one direction it rapidly spread over the Palatine and Velia up to the low cliffs of the Esquiline, and in another it laid waste the Aventine, the Forum Boarium and Velabrum until it reached the Tiber and the solid barrier of the Servian wall. After burning fiercely for six days it suddenly started afresh in the northern quarter of the city and desolated the regions of the Circus Flaminius and the Via Lata, and by the time that it was finally quenched only four of the fourteen regiones remained untouched; three had been utterly destroyed and seven reduced to ruins. The conflagration is said by all authorities later than Tacitus to have been deliberately caused by Nero himself. But Tacitus, though he mentions the rumors, declares that its origin was uncertain, and in spite of such works as Profumo's Le fonti ed i tempi dello incendio Neroniano (1905), there is no proof of his guilt. By Nero's orders, the open spaces in the Campus Martius were utilized to give shelter to the homeless crowds, provisions were brought from Ostia and the price of corn lowered. In rebuilding the city every precaution was taken against the recurrence of such a calamity. Broad regular streets replaced the narrow winding alleys. The new houses were limited in height, built partly of hard stone and protected by open spaces and colonnades. The water supply, lastly, was carefully regulated. There is, however, no doubt that this great disaster told against Nero in the popular mind. It was regarded as a direct manifestation of the wrath of the gods, even by those who did not suspect the emperor. This impression no religious ceremonies, nor even the execution of a number of Christians, as convenient scapegoats, could altogether dispel. But Nero proceeded with the congenial work of repairing the damage. In addition to the rebuilding of the streets, he erected a splendid palace, the "golden house", for himself. The wonders of his Domus aurea were remembered and talked of long after its partial demolition by Vespasian. It stretched from the Palatine across the low ground, afterwards occupied by the Colosseum, to the Esquiline. Gold, precious stones and Greek masterpieces adorned its walls. Most marvellous of all were the grounds in which it stood, with their meadows and lakes, their shady woods and their distant views. To defray the enormous cost, Italy and the provinces, says Tacitus, were ransacked, and in Asia and Achaia especially the rapacity of the imperial commissioners recalled the days of Mummius and of Sulla. It was the first occasion on which the provincials had suffered from Nero's rule, and the discontent it caused helped to weaken his hold over them at the very moment when the growing dissatisfaction in Rome was gathering to a head. Early in 65 Nero was panic-stricken by the discovery of a formidable conspiracy involving such men as Faenius Rufus, Tigellinus's colleague in the prefecture of the praetorian guards, Plautius Lateranus, one of the consuls elect, the poet Lucan, and, lastly, not a few of the tribunes and centurions of the praetorian guard itself. Their chosen leader, whom they destined to succeed Nero, was C. Calpurnius Piso, a handsome, wealthy and popular noble, and a boon companion of Nero himself. The plan to murder Nero was frustrated by a freedman Milichus, who, in the hope of a large reward, disclosed the whole plot. Piso, Faenius Rufus, Lucan and many of their less prominent accomplices, and even Seneca himself (though there seems to have been no evidence of his complicity) were executed. But, though largesses and thanksgivings celebrated the suppression of the conspiracy, and the round of games and shows was renewed with even increased splendor, the effects of the shock were visible in the long list of victims who during the next few months were sacrificed to his restless fears and resentment. Conspicuous among them was Paetus Thrasea, whose unbending virtue had long made him distasteful to Nero, and who was now suspected, possibly with reason, of sympathy with the conspirators. The death of Poppaea in the autumn 65 was probably not lamented by anyone but her husband, but the general gloom was deepened by a pestilence, caused, it seems, by the overcrowding at the time of the fire. Early, however, in the summer of 66, the Parthian prince Tiridates visited Italy. This event was a conspicuous tribute to the ability both as soldier and statesman of Cn. Domitius Corbulo. As long ago as 54 the news reached Rome that the Parthian king Vologaeses had expelled the king recognized by Rome from Armenia and installed in his place his own brother Tiridates. Orders were at once issued to concentrate all available forces on the Cappadocian frontier under Corbulo, the first soldier of his day. After some time spent in making his army efficient, Corbulo invaded Armenia and swept victoriously through the country. Armenia was rescued and Corbulo proposed that Tiridates should become king of Armenia on condition of his receiving his crown as a gift from Nero. But the government in Rome had a plan of its own, and a certain Tigranes, long resident in Rome, but a stranger to the Armenians, was sent out, and Corbulo was obliged reluctantly to seat him on the Armenian throne. Tigranes's position, always insecure, soon became untenable, and it became necessary for Rome to intervene once more. A Roman force under Caesennius Pactus was sent to restore Tigranes and re-establish Roman predominance. Paetus, however, was no Corbulo. He was defeated, and Corbulo, now legate of Syria, was obliged to come to his rescue. The result was the final triumph of Corbulo's policy. Tiridates agreed to accept the crown of Armenia from the hands of Nero. In royal state he travelled to Italy, and the ceremony of investiture was performed at Rome with the utmost splendor. Delighted with this tribute to his greatness, Nero for a moment dreamt of rivalling Alexander the Great. Expeditions were talked of to the Caspian Sea and Ethiopia, but Nero was no soldier and quickly turned to a more congenial field. He had already, in 64, appeared on the stage before the half-Greek public of Naples. But his mind was now set on challenging the applause of the Greeks themselves in the ancient home of art. Towards the end of 66 he arrived in Greece with a retinue of soldiers, courtiers, musicians and dancers. The spectacle presented by Nero's visit was unique. He went professedly as an enthusiastic worshipper of Greek art and a humble candidate for the suffrages of Greek judges. At each of the great festivals, which to please him were for once crowded into a single year, he entered in regular form for the various competitions, scrupulously conformed to the tradition and rules of the arena, and awaited in nervous suspense the verdict of the umpires. The dexterous Greeks humored him to the top of his bent. Everywhere the imperial competitor was victorious, and crowded audiences importuned him to display his talents. The emperor protested that only the Greeks were fit to hear him, and rewarded them when he left by the bestowal of immunity from the land tax on the whole province, and by the gift of the Roman franchise; he also planned and actually commenced the cutting of a canal through the Isthmus of Corinth. If we may believe report, Nero found time in the intervals of his artistic triumphs for more vicious excesses. The stories of his mock marriage with Sporus, his execution of wealthy Greeks for the sake of their money, and his wholesale plundering of the temples were evidently part of the accepted tradition about him in the time of Suetonius, and are at least credible. Far more certainly true is his ungrateful treatment of Domitius Corbulo, who, when he landed at Cenchreae, fresh from his successes in Armenia, was met by an order for his instant execution and at once put an end to his life. Meanwhile the general dissatisfaction was coming to a head, as we may infer from the urgency with which the imperial freedman Helius insisted upon Nero's return to Italy. Far more serious was the disaffection which now showed itself in the rich and warlike provinces of the west. In northern Gaul, early in 68, the standard of revolt was raised by Julius Vindex, governor of Gallia Lugdunensis, and himself the head of an ancient and noble Celtic family. South of the Pyrenees, P. Sulpicius Galba, governor of Hispania Tarraconensis, and Poppaea's former husband, Marcus Salvius Otho, governor of Lusitania, followed Vindex's example. At first, however, fortune seemed to favor Nero. It is very probable that Vindex had other aims in view than the deposition of Nero and the substitution of a fresh emperor in his place, and that the liberation of northern Gaul from Roman rule was part of his plan. If this was so, it is easy to understand both the enthusiasm with which the chiefs of northern Gaul rallied to the standard of a leader belonging to their own race, and the opposition which Vindex encountered from the Roman colony of Lugdunum and the legions on the Rhine. For it is certain that the latter at any rate were not animated by loyalty to Nero. Though they defeated Vindex and his Celtic levies at Vesontio (Besan�on), their next step was to break the statues of Nero and offer the imperial purple to their own commander Virginius Rufus. He declined their offer, but appealed to them to declare for the senate and people of Rome. Meanwhile in Spain Galba had been saluted imperator by his legions, had accepted the title, and was already on his march towards Italy. On the road the news met him that Vindex had been crushed by the army of the Rhine, and for the moment he resolved to abandon his attempt. Meanwhile, Nero had reluctantly left Greece, but returned to Italy only to renew his revels. When on the 19th of March the news reached him at Naples of the rising in Gaul, he allowed a week to elapse before he could tear himself away from his pleasures, and then contented himself with proscribing Vindex, and setting a price on his head. The revolts in Spain and Germany terrified him too late into something like energy. The senate almost openly intrigued against him, and the populace were silent or hostile. The fidelity of the praetorian sentinels even was more than doubtful. When finally the palace guards forsook their posts, Nero despairingly stole out of Rome to seek shelter in a freedman's villa some four miles off. There he heard of the senate's proclamation of Galba as emperor, and of the sentence of death passed on himself. On the approach of the horsemen sent to drag him to execution, he collected sufficient courage to save himself by suicide. Nero died on the 9th of June 68, in the thirty-first year of his age and the fourteenth of his reign, and his remains were deposited by the faithful hands of Acte in the family tomb of the Domitii on the Pincian Hill. With his death ended the line of the Caesars, and Roman imperialism entered upon a new phase. His statues were broken, his name everywhere erased, and his golden house demolished; yet, in spite of all, no Roman emperor has left a deeper mark upon subsequent tradition. The Roman populace for a long time reverenced his memory as that of an open-handed patron, and in Greece the recollections of his magnificence and his enthusiasm for art were still fresh when the traveller Pausanias visited the country a century later. The belief that he had not really died, but would return again to confound his foes, was long prevalent, not only in the remoter provinces, but even in Rome itself; and more than one pretender was able to collect a following by assuming the name of the last of the race of Augustus. More lasting still was the implacable hatred of those who had suffered from his cruelties. Roman literature, faithfully reflecting the sentiments of the aristocratic salons of the capital, while it almost canonized those who had been his victims, fully avenged their wrongs by painting Nero as a monster of wickedness. In Christian tradition he even appears as the mystic Antichrist, who was destined to come once again to trouble the saints. Even in the middle ages, Nero was still the very incarnation of splendid iniquity, while the belief lingered obstinately that he had only disappeared for a time, and as late as the 11th century his restless spirit was supposed to haunt the slopes of the Pincian Hill.